Editor’s Note: The following article is an excerpt from Walks, Walls and Patio Floors, the new release from Sunset Books. The book is full of great “how-to” stories and step-by-step photos on enhancing your outdoor living space with brick, stone, pavers, concrete, tile and more. To learn more, visit www.sunsetbooks.com. Low, short garden walls can be built with a single wythe—that is, with only one horizontal row of bricks. But such walls are not strong. You can even push them over by hand. Double-wythe brick walls are much stronger, though if they are more than 2 feet high, they may not be strong enough to act as retaining walls. Brick walls must rest atop a solid concrete footing. Patterns, called bonds, allow you to build double-wythe walls that interlock in various ways. Bricks turned sideways to tie the wythes together are called headers, while the rest of the bricks are stretchers. Most bonds require cutting. 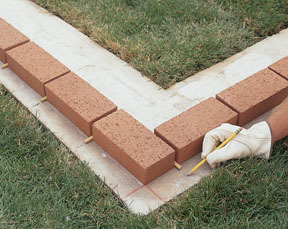 To help you maintain rhythm and concentration as you throw mortar and lay bricks, cut a number of bricks ahead of time. A professional mason can throw a neat line of mortar at just the right thickness with ease and speed. Don’t expect to equal that after a couple of hours of practice. But you can learn to throw mortar well enough to construct a straight wall with neat joints. Type N is usually fine choice of mortar. 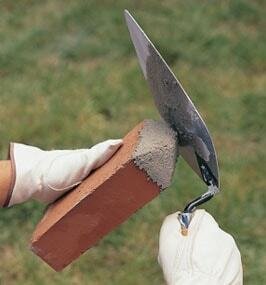 Mix the mortar with a hoe or shovel in a wheelbarrow or mortar tray, or use a paddle mixer in a large plastic tub. You can scoop mortar out of the mixing container, but it’s often easier to load a shovelful onto a hawk or a piece of plywood about 16 inches square and work from there. Make up about one-third of a bag of mortar mix with just enough water so it’s thick enough to hold its shape when you cut ridges in it with a mason’s trowel. If you scoop up some mortar with the trowel and hold it upside down, the mortar should stick to the trowel for a second or two. Here’s how to practice your technique. 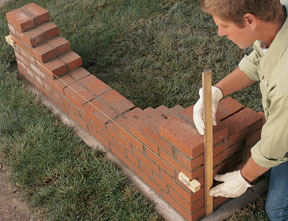 Before you start laying bricks, make a story pole so you can quickly measure bricks for the correct height. 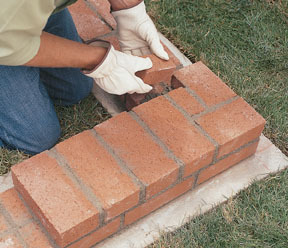 Lay a number of bricks with 3⁄8-inch spaces between them, on edge on a flat surface. 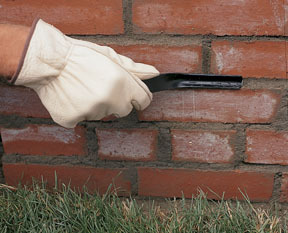 Then lay a length of 1-by-2 or 1-by-4 next to the bricks and draw marks indicating the centers of each mortar joint. Alternatively, purchase a ready-made story pole. A standard model has marks every 8 inches to indicate three courses of common brick plus the mortar joints. Snap chalk lines on the footing indicating the outline of the wall. Place the bricks on the footing in a dry run, with 3⁄8-inch dowels between them to represent the joints. Make sure you understand how the bricks will be laid out at the corner. You might need to cut a brick or two. You may choose to minimize cutting by moving one wall over an inch or two. With a pencil, mark the footing for the centers of each joint. Remove the dry-laid bricks. Starting at a corner or at the end of a wall, throw a line of mortar for the first three bricks. Set and place the first brick. Butter one end of the other bricks and set them. Push the bricks into place and see that the centers of the joints are at the pencil marks. 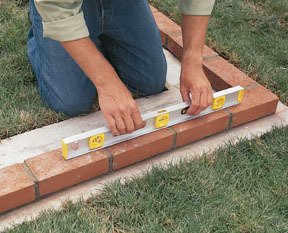 Use a level to check that the bricks form an even surface in both directions. Scrape away excess mortar. Repeat for the second wythe and lay bricks for the start of an adjoining wall if you are at a corner. Be sure you understand how the bricks must be stacked. As you stack, every now and then hold a level against the joints to see that they line up vertically. 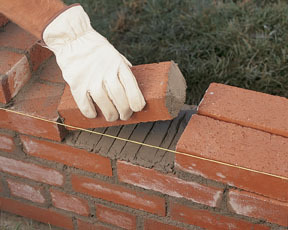 For common bond (shown here), a header course needs two 3/4 bricks and two 1/4 bricks, known as closures, at each corner. 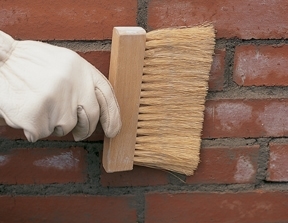 Scrape away excess mortar as you go. Every so often, check the joints to see if they need to be struck. Continue building the corner or the end of the wall, which is called a lead. Make a stack seven or eight bricks high. As you go, use a level to check that the corner is plumb and the courses level. Use a story pole to check joint thickness. Do not slide bricks to adjust their position, unless you have laid them within the past two minutes. Build a lead at the other end of the wall in the same way and check it with the story pole and level. Lay all the in-between bricks for the bottom course of both wythes, using the pencil lines as guides. Hook mason’s blocks and stretch a mason’s line from one lead to the other at the center of a joint. The line should be taut and about 1⁄8 inch from the bricks. For each course, move the line blocks up one joint and use the line as a guide for the height and for the outer edge of the wall. Don’t let bricks touch the line. The last brick in the middle of a course, called the closure brick, is buttered at both ends. Butter it generously and slip it in straight down. Avoid sliding it. You may need to use a striking tool to force more mortar into one joint. Every 20 minutes or so, depending on weather conditions, test the joints by pressing with your thumb. If a thumbprint holds its shape, it’s time to strike. With a brick jointer, smooth all horizontal joints, then smooth the verticals so water will drain properly. If a bit of mortar oozes out from the jointing tool, leave it or it will smear. Brush off excess mortar once it has started to harden and appears crumbly. If the mortar smears, stop and wait a few minutes longer. You may be able to wipe any smears away with a damp sponge, but take care not to get the joints very wet or you will weaken them. Alternatively, wait a day and then clean with a mild muriatic acid solution. Excerpted by permission of Sunset Publishing Corporation from Walks, Walls & Patio Floors by Jeanne Huber and the editors of Sunset Books, published in February 2008 by Sunset Books.